Travis Gaertner is an elite athlete. He was born without a left leg and with only half of his right leg. 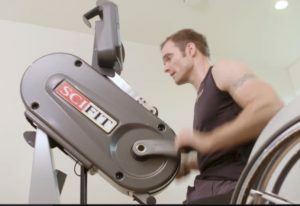 But being in a wheelchair hasn’t kept him from being extremely active. And it hasn’t stopped him from the highest levels of athletic competition. Gaertner, who lives in a Seattle suburb, earned Paralympic gold medals while competing with the Canadian team in wheelchair basketball in the 2000 games in Sydney and the 2004 games in Athens. Gaertner, who became a U.S. citizen in 2012, now has his sights set on more Paralympic competition. 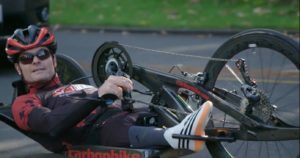 The 38-year-old is training for a spot in the 2020 Tokyo games in handcycling, a version of cycling that uses a hand-powered three-wheeled bike. His drive to return to the Paralympics stemmed from a trip to a gym. Fitness has been ingrained in Gaertner. He’s been active and athletic since he was a child. Even if you’re not an elite athlete, it’s hard not to be inspired by Gaertner’s dedication to fitness. He truly believes in the vitality he receives from his active daily life. He’s a great example for his three kids and for anyone who has trouble starting their own fitness routine. 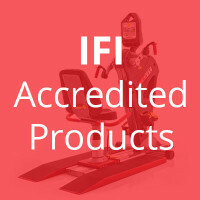 Category Uncategorized | Tag PRO1, success stories, exercise | Bookmark the permalink.